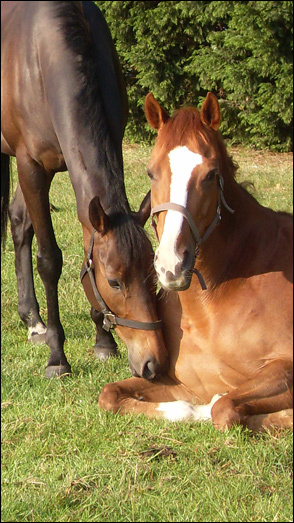 We aim to give every horse that comes into our care a second chance in life in a loving home. Unfortunately that is not always possible. Horses either a little too-spirited or who simply require specialist attention on a daily basis are unlikely to find a good home and are given Sanctuary. We would never give them up for the world. We don't give up on them - and neither should you. When you sponsor a Sanctuary horse, your donations are used to help all the horses in our care and to give those horses who would otherwise meet a very sad end a happy ending to their story. The Sanctuary Sponsorship Scheme gives you the opportunity to join the family of Sanctuary Supporters and help us help those who cannot help themselves. The photographs on this website are distressing http://www.chai.org.il/en/compassion/reality/reality_horseslaughter_uk.htm. But it doesn't have to end like this. You CAN make a difference! The Sanctuary Adoption scheme gives you the opportunity to join the family of Sanctuary Supporters and help us help those who cannot help themselves.